those were always fun and challenging little missions too. The game itself was quite a bit of fun. Buggy and unbalanced, but that would have been remedied with time. I'm really saddened we don't have a new one on the horizon right now. We could really use a good old school strategy game. All the popular strategy games right now are either like a MOBA/DOTA style game or a 4X/ CIV-SIM. Alternate missions add considerably to the replay value of the game. The problem with C&C though it that very often two selectable regions happen to be in the same country, and if you click on the country instead of the attack arrow, you'll always get the same mission (which I think is the first in the list of variants). On my first playthroughs I would click on a random spot on the country map because this is how map selection works in Dune 2. Red Alert remedied this by explicitly making the arrow points clickable, but then again you get less variety in this game as stated above. The optional side-missions in TS sometimes make the main mission way too easy. Besides there is no sure way to tell whether a mission is optional or not, unless you know beforehand or guess from the mission objectives. This also adds to replay value of course. The Commando/Tanya is by definition a unit that requires manual management, otherwise it would be too easy and overpowered. BTW, have you noticed that the Commando has become the iconic GDI unit (first and foremost based on the mission discussed above, no doubt), even though actually there are more Nod missions both in the campaign and in Covert Ops that make use of the Commando? I was never a fan C&C games. However, the spin-off series - Generals - was one of my favourite RTS series ever. No matter how many times I played this games, I always end up re-installing the game after a couple of years. I wondered, have anyone been thinking about making a mod that would allow you to play CNC3 campaigns on Kane's Wrath ? Hopefully, it won't be like Age of Empires' foray into the mobile field - complete garbage. I wonder why they even bothered doing this. The C&C brand is dead. Nobody will care about this. On the other hand, at least they have nothing to lose any more since folks already know that the series is burnt out and expect nothing. The game has already been panned by C&C fans. Personally I feel that by deciding to make a mobile game, the developers/copyright holders already admit that the franchise is not worth anything more than trying to squeeze a few more bucks out of casual gamers and folks who might try it out of purely nostalgic reasons. But I may be wrong on this. Make something good that we can get behind then we'll support you and trust that you can actually make a better game with a bigger budget. I wonder why they even bothered doing this. The C&C brand is dead. Nothing is dead as long as it has a legacy and some financial value. C&C is not dead, it's just dormant because EA are a bunch of idiots and they managed to essentially kill the 7th generation version of the franchise with C&C 4. The thing is though that a new, real C&C can happen anytime, there will be an audience for it. As for this mobile garbage: it's mobile garbage so no one cares, I think the outrage was caused by EA being their usual idiot selves and presenting this trash as part of their E3 conference. If there's any new C&C anyway it would be in name only as all the relevant folks left to form Petroglyph ages ago. To be fair, I haven't played the post-Westwood titles to any extent besides the demo versions (not counting Generals, haven't played that at all) so it's not really easy to judge for me, but the Westwood era games are already very diverse, even though clearly all being developments of the same game mechanics. I'm thinking it would be reasonable to have a clear definition of what makes a "true" C&C game (apart from having Joe Kucan as Kane) because frankly I'm a bit at a loss here. From what I remember, the original C&C & Red Alert existed in the market where Blizzard's Warcraft games were the main competitor, with a fair number of clones of both C&C and Warcraft around to spice things up a little. Apart from the modern/futuristic setting, C&C was noted for asymmetrical tech trees of both factions whereas in Warcraft 1 & 2 the sides' units and tech basically mirror each other with the exception of magic (which does make a difference though). C&C also allowed for pretty complex in-game scripted events (even more so with Red Alert), which was something almost completely non-existent with Blizzard before StarCraft, although I'm not sure how evident this was for players altogether. I cannot tell anything about multiplayer capabilities of any of the games, but both Red Alert and Warcraft II support skirmish games versus the AI. Tiberian Sun built upon the foundations of previous games, adding new units and to extent new mechanics, and the scripting system allowed for more complex scenarios. StarCraft on the other hand was a complete overhaul of the 'Craft gameplay philosophy with three almost completely different races while a scenario scripting system was introduced for the first time. Interestingly both games shifted away from the player commander-centred storytelling in the singleplayer campaigns, with TS completely eschewing this (the player commander would then return in Firestorm while StarCraft introduced some very intense non-player character interaction as the main driver of the plot while keeping the Commander/Cerebrate/Executor with a more or less limited narrative function. Firestorm again built upon TS's foundations and as far as I can tell actually properly implemented some design ideas that were planned for TS but not fully realised as the development was rushed. Some very complex scenes can be played out in game, with dialogue voice-overs. Blizzard kinda-sorta caught up with this in Brood War. On the other hand, FS completely discarded the map selection routine making the campaigns completely linear but this could've probably been expected from an expansion pack. Notably, all previous C&C game expansions were simply "mission disks" with no overt campaign linking the individual scenarios (although some of the Counterstrike and Aftermath missions are linked chronologically, but can still be played in any order). 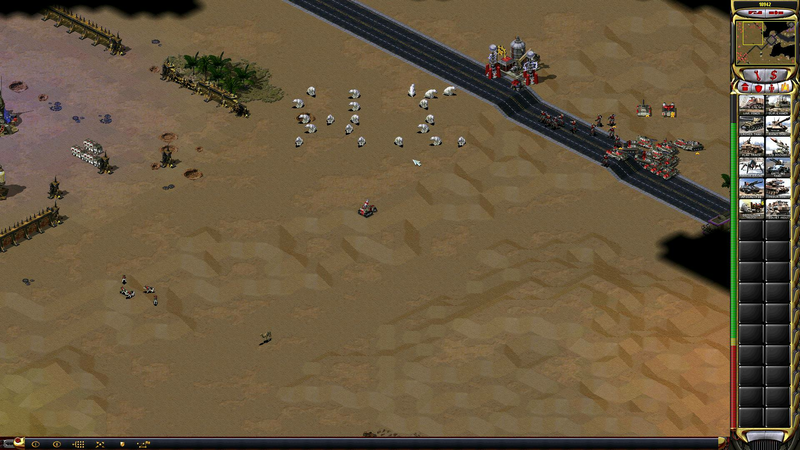 Red Alert 2 pretty much refined the TS formula but I felt that some of the less trivial innovations from TS were discarded for the sake of streamlined gameplay, such as subterranean units and concrete that can be built to block them, mobile detectors, laser fences etc. Don't forget jammin' music. Frank Klepacki did a great job of composing the background tracks that went a long, long way towards building the experience and atmosphere. Stuff that sticks in your head after you stop playing, which I can't really say for the post-Westwood era. I love Frank K's work But then again, I love Glenn Stafford's stuff from Warcraft II and StarCraft too. Admittedly, they're very different in style. Frank Klepacki's soundtracks stand on their own while Blizzard's stuff is more of video game music that is tied to the game itself (it's not like I don't listen to the tracks occasionally outside of playing too). CNC3 is really worth it, especially it's expansion Kane's Wrath ! BTW, since this is C&C thread, I think this is a perfect place to tell about my little discovery. I'll be a little bit lazy and just copy and paste my post from C&C forums. Years ago I was playing Yuri's Revenge mission "Romanov on the run". While playing this mission, I noticed a huge pack of polar bears coming off the map from the north direction. I knew I was witnessing a secret. However I was never able to reproduce that secret. Years have passed and I've decided to come back to this topic. My first attempts of trying to reproduce that secret failed. Untill I finally looked into Final Alert editor and discovered there are special triggers. It appears one unit has to be exactly in a specific spot (in the attached picture, it's the halftrack in the middle of screen), wait there a moment and this will trigger the polar bears! Those teddies will shape the word "HI". It's kinda a funny secret and I am astonished how this one was out of the radar for so long. Yes, I've been trying to search everywhere whether there was any other person who found it, but I had no luck. Ohh and these teddies are controllable . So yeah, the secret which hasn't been documented for 17 years since I was the first person who documented that. Congrats on finding it. "Easter egg" is probably the correct term to use here? That seems like a really, really obscure way to trigger something, so I'm not surprised it took so long. Then again if it's visible in the editor I suppose someone might have found it. Are the bears useful units? I am pretty sure it was found already by someone else, however no one documented that for some reason. Deeper looking inside Internet revealed one Youtube comment saying someone found them too, but didn't know how to trigger them. And no, they are just bears, they can attack, but they do little damage. The like bar on the video says otherwise. I can't tell if it's good or not; I have no experience with mobile RTS and I don't plan on changing that. I suppose it's a good sign that they're doing something with the franchise. Let's just hope that EA takes all the intense negativity as a sign that people do care about the franchise, and that it's worth them making a new, full, good quality PC RTS. Most of folks are mad because it's a mobile game. Maybe it's generally OKish game, but people wanted another C&C style game. C&C4 showed that changing the formula was totally a bad move. And I highly doubt EA wants anything good for this franchise. Do you know by any chance Dungeon Keeper made by Bullfrog? EA also tried to milk that franchise and made a mobile game which was an abomination. I don't remember the original C&C being hard in the first place, except maybe for some Nod missions where you don't have a base. It can get tedious later in the game, but often the enemy base has a back door that is less closely guarded than the front entrance. In every GDI mission if you blow up all Nod SAM sites, you'll get airstrikes, but somehow I never really used that option except for mission three where this is explicitly introduced. Sometimes the SAMs are placed so that you're not very likely to get to them before taking down a substantial portion of other defences, and airstrikes get pretty much useless at that point. C&C Tiberian Dawn and Red Alert remasters incoming, developed by Petroglyph Games (the studio that was created by Westwood employees after the Westwood shut down). EA did the right thing for once, C&C is back where it belongs. i was almost going to slap myself to find out whether i am dreaming or not, but decided not to. Unhatched chickens.....they'll probably throw it on Origin like Microsoft put Age of Empires Definitive Edition on the Windows Store. I'm not bothering with that. Otherwise I'd be all over this.